Baseball player throwing a baseball. Baseball and softball are not the most physical sports played in the United States, but they certainly require healthy bodies to be successful. Baseball and softball both require players to have properly functioning vertebrae to perform the necessary maneuvers during play. Without a properly functioning back, a player will have hard time throwing the ball, catching the ball, and even hitting the ball. This is why chiropractic care is such a crucial part to the success of baseball and softball players because it helps keep a player’s body in good health. This is something I like to call the chiropractic grand slam. In baseball and softball, a home run is when a player hits the ball over the outfield fence within the boundaries of play. That’s when the batter and all the runners on base run the bases all the way to home plate. A grand slam is when a player hits a home run with the bases loaded, which is when there’s a player on each base. In baseball terms, this is called clearing the bases. Grand Slams are bad for defense but great for offense in baseball. In chiropractic care, doctors of chiropractic focus on treating conditions and injuries related to the spine and other joints in the body. Chiropractors identify misalignments or subluxations in body and treat them with a technique called a spinal adjustment, so the body can heal naturally from any injury it sustained. We’ll call this clearing the subluxations. Chiropractic adjustments are bad for pain but great for the body. If you or your child have suffered an injury while playing baseball, depending on the condition that either of you are suffering from, a chiropractor may be able to assist in the recovery process. Call your local chiropractor to schedule an appointment today. “Chiropractic services are used most often to treat neuromusculoskeletal complaints, including but not limited to back pain, neck pain, pain in the joints of the arms or legs, and headaches” (acatoday.org, 2017). Why do I call it the chiropractic grand slam? Well, when a person is in pain and a doctor of chiropractic provides an adjustment that clears the pain, it can feel just as good as when a player clears the bases with a grand slam homerun. Maybe not as exciting but an adjustment can be just as relieving. Okay, let’s get down to the real benefit of chiropractic care for baseball and softball players. Essentially, a chiropractor can help the body function properly by providing chiropractic adjustments in the high-tense areas of the body. The most common injuries that baseball and softball players suffer happen to the shoulders and the elbows. The reason these areas are the most injured is based on overuse. According to a study by the Journal of Athletic Training published by the US National Library of Medicine National Institutes of Health, injuries are three times more likely to happen during a game compared to practice (ncbi.nlm.nih.gov, 2007). Although baseball and softball are not considered high-impact sports, players still use their bodies to hit, catch, throw, and run during practice and games. Because throwing the ball is the most frequent action in baseball and softball, shoulders and elbows are subject to overuse more than any other part of the body. In fact, baseball and softball players throw the ball an average of 200 times per game, which accounts for 45 percent of upper body injuries (ncbi.nlm.nih.gov, 2007). 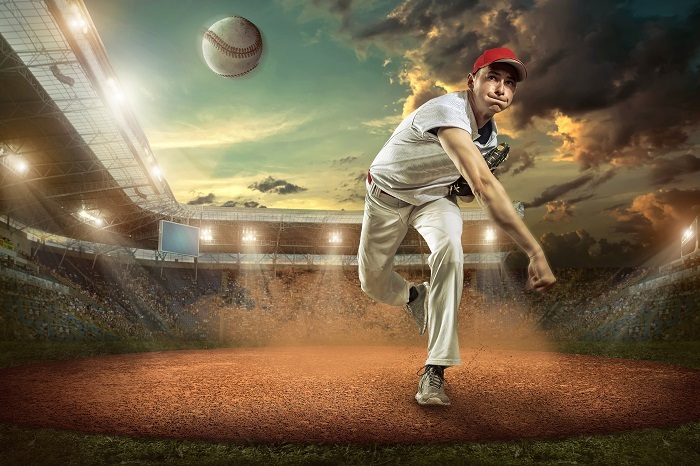 Each year, several baseball and softball players suffer from injuries such as sprains and strains to elbows and shoulders, but that is where knowing a good chiropractor can help. Chiropractors are highly experienced in aiding the body back to recover from strains and sprains because the nerves that are attached to the muscles begin in spine. Chiropractic care has been found to help athletes improve flexibility and range of motion, so athletes can be more effective in their respective sport. Every athlete has experienced muscle soreness, but not all have undergone chiropractic care as a natural pain reliever for sore muscles and joint pain. Overall, a chiropractor can provide ideal treatment for injuries that occur from overuse, and, in some cases, he or she can provide an excellent option for baseball players to avoid surgery. Keep in mind that not everybody is a good candidate for chiropractic care, and it is not a cure for any major injury. Still, chiropractic treatment can allow the central nervous system and the nerves that extend from the spine to flow freely, allowing the body to communicate clearly with other parts of the body.